I believe that every true foodie has a really good brownie recipe in their arsenal. If you don’t have one, I would be skeptical of your foodie status. 😉 And if you don’t have one… you need one! So, what constitutes a good brownie? 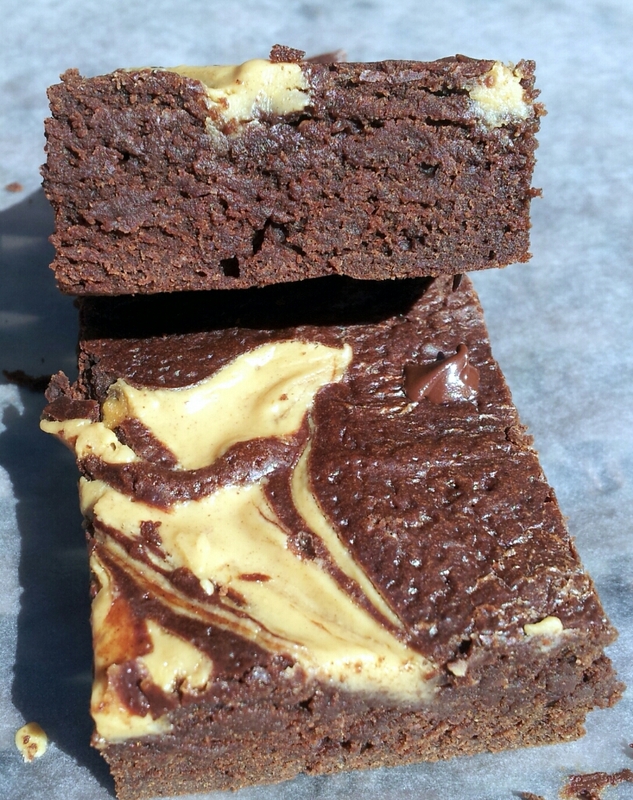 In my opinion I feel that a good brownie has a few qualities that just can’t be compromised. First, you have to use butter, yep I said it. I am just not down with canola or veggie oil any more, I usually replace that with coconut oil, but in this instance I think that butter is the best. I used light butter, but you still get all the taste without all the calories! For best results, don’t try to replace the butter with applesauce, it just won’t do. Secondly, a brownie needs to be sweet, but not overwhelmingly sweet. I’m proud to say that these little babies are refined sugar free! They have just the right amount of sweetness. Now remember, the sugar factor can change depending on your add ins, so just keep that in mind. Essentially the recipe in its basic form is sugar free without any extra goodies. If you decide to opt for regular sugar over Truvia keep in mind that you will have to double it to achieve the same flavor and this can jeopardize the integrity of these little sweet treats. 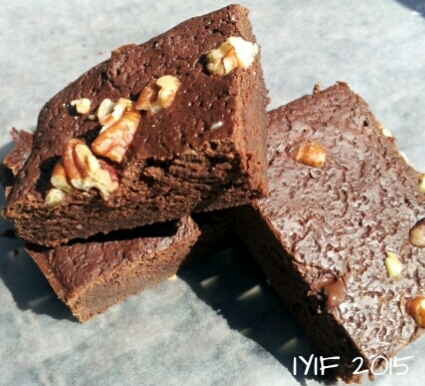 Last, but not least, it is important for brownies to be moist and fudge like without being under cooked. To make sure that these are moist, with a compact crumb, rather than like a cake don’t try and sneak any baking powder or baking soda into the mix. Reserve those ingredients for other treats that need leavening with a looser, fluffier texture. That pretty much sums up the essentials of a good brownie. When I baked these I didn’t have a pan that would give me the thickness that I desired so I made my own pan out of nonstick aluminum foil. It was approximately 4×8 or 5×10 I think, it was a little crooked at the bottom and I didn’t have a ruler on hand so it was hard to tell, but depending on how thick, or thin, you like your brownies will determine what size pan you will use. *I wanted to test 3 add ins (Which are not in the calorie count) so I just did them all in the same pan, in 3 different sections. One section was mini chocolate chips; the next section was pecans, and the third section I swirled in some peanut butter. (After looking at it I believe a cream cheese mixture would have gone very nicely!) 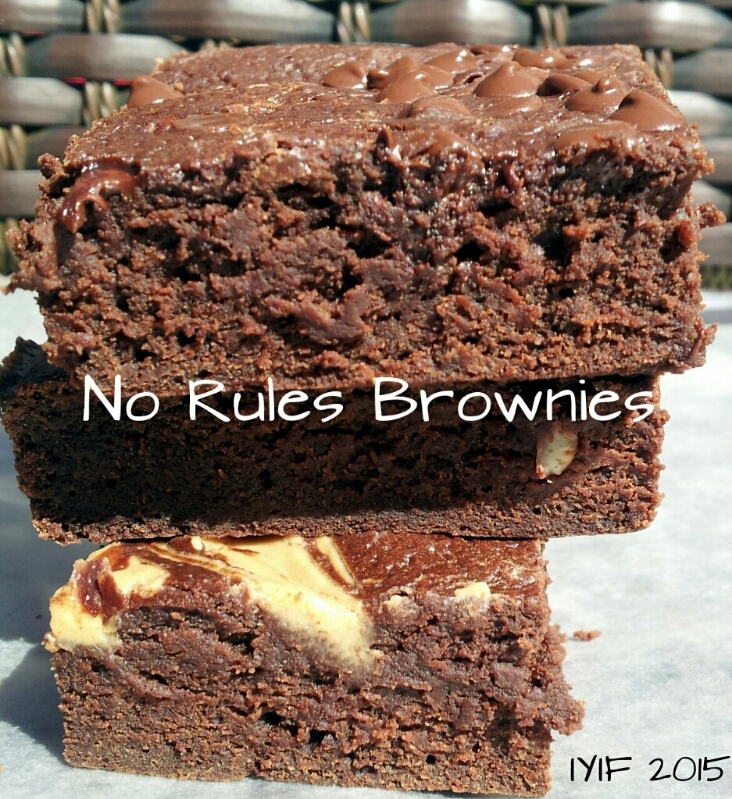 This is why I call these “no rules brownies” the basic brownie recipe is divine, but all the add ins…. That is totally up to you! 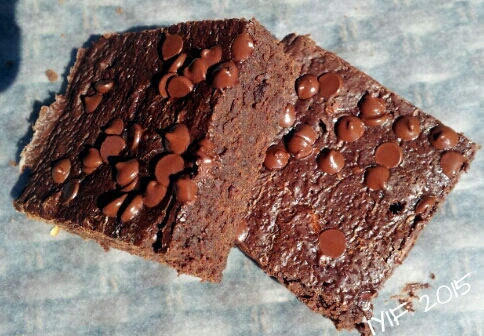 Very well written and I love the comment about if you don’t have a good brownie recipe then you question their status as a foodie. I plan to try these little babies out soon. Thanks for sharing it. A brownie with no rules? Is that… safe?